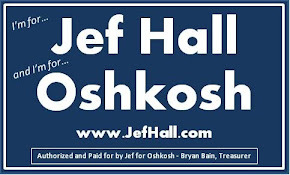 Jef Hall, Candidate for the Oshkosh Common Council, will bring back the 5th Tuesday Forums started by former Deputy Mayor Bryan Bain. The first of these forums has been scheduled for Tuesday, March 29th, at the Oshkosh Public Library. The public is invited to this forum and discussion held in the Community Meeting Room beginning at 6:00 PM. The public, current Oshkosh representatives and candidates are all invited to participate in this open community discussion. In the tradition of Bryan Bain’s great work in Oshkosh, minutes and answers to questions raised will be published online at www.JefHall.com. Please contact Jef Hall – 920.203.6883 or jef@jefhall.com with any questions.